Dr Raj Harjani is a practicing Skin and Venereal disease specialist since 1979. He is the owner of this nursing Home since 1986. 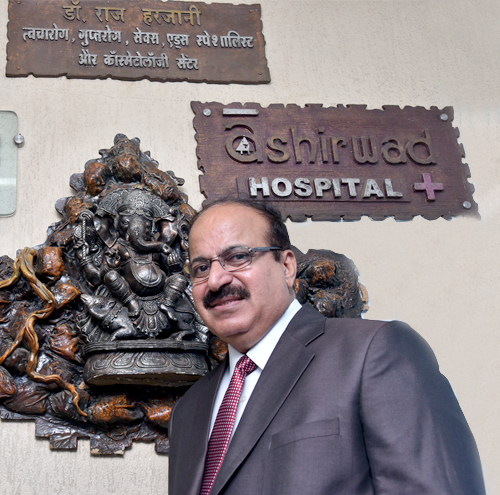 Provides consultation, admission and operative facilities. Topiwala National Municipal Medical College and B.Y.L. Nair Hospital, Mumbai Central, Mumbai, M.S., India. He has done his graduation (M.B.B.S.) in 1977. Seth G.S. Medical College and K.E.M. Hospital, Parel, Mumbai, M.S., India. Post graduation in Skin and Venereal diseases (D.V.& D) in 1979. Lokmanya Tilak Municipal Medical College and General Hospital, Sion, Mumbai, M.S., India. He has worked as a House Officer in Skin and V.D. in 1978. Rajawadi Hospital, Ghatkopar, Mumbai, M.S., India. He has worked as Medical officer in the Skin Department. (collaborative program of Government of Maharashtra and The University of Texas, Houston, U.S.A.) at Grant Medical College and Sir J.J. Group of Hospitals, Mumbai. He has worked as a core committee member of AIDS Research and Control Centre from 1994 till 2004. He has trained and conducted various fora in Skin and HIV/AIDS for medical practitioners of Mumbai, Thane, Bhiwandi and Ulhasnagar in the form of "AIDS Update". He has visited various departments like HIV Medicine, HIV Resistance and Public Health Department at The Johns Hopkins Medical Institute, Baltimore, Maryland, USA a number of times and exchanged his views with the faculty there. He has traveled abroad and attended International AIDS Conference IAS as a delegate and as a speaker. IAS-AIDS Conferences at -Barcelona, Spain in 2002; Bangkok, Thailand in 2004; Toronto, Canada in 2006; Sydney, Australia in 2007, Mexico City, Mexico in 2008., Austria (vienna) 2010, Rome - Italy 2011, Washington DC (USA) 2012, Kuala Lumpur, Malaysia 2013. He has attended International AIDS Conferences and Conferences conducted by International AIDS Society (IAS) several times as a delegate and/or as a speaker. Presented “Discordant couples can have a HIV Negative child without infecting the mother when father is HIV positive and mother is HIV Negative”. Audio Visual presentation on “Care of face - Befriend your Skin for students, women and beauticians organized by Young Concepts, India. Authored few chapters on Opportunistic Infections O.I.s and Anti-retroviral Therapy in AIDS, Reference guide for medical practitioners. Contributor for Quality Improvement (Q.I.) self assessment tool for private sector providers in HIV Medicine conducted by F.H.I. (Family Health International) and PSP One. Invited by USAIDS/ AVERT Society to conduct lectures for general practitioners.